OXFORD, Miss. 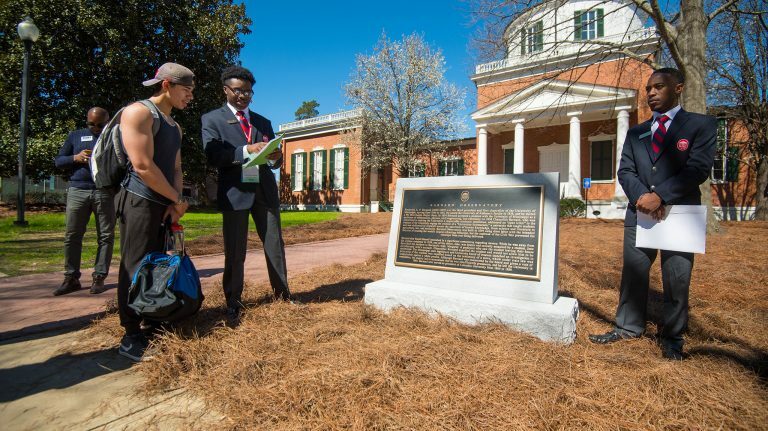 – The University of Mississippi’s Chancellor’s Advisory Committee on History and Context’s work culminated Friday (March 2) with a “significant moment” in the university’s history: the unveiling of six new markers that are the product of months of study and feedback from hundreds of stakeholders. The Chancellor’s Advisor Committee on History and Context includes Jeff Jackson, Associate Professor of Sociology. Chancellor Jeffrey Vitter led the ceremony at the Gertrude C. Ford Center for the Performing Arts. He said that as Mississippi’s flagship university, UM has long been committed to honest and open dialogue about its history and the CACHC’s work represents that commitment in action – informed by expertise and conducted with respectful candor. Hall that recognizes the University Greys, a Civil War company of primarily UM students that suffered 100 percent casualties – killed, wounded or captured. “These plaques are daily reminders of our obligation to learn from the past and commit to an inclusive future,” Vitter said. The ceremony featured a keynote address by John Neff, associate professor of history and director of the Center for Civil War Research. Neff served on the CACHC as well as the planning committee responsible for the unveiling event. Neff, who received a standing ovation for his speech, said the university finds itself at a “crossroads,” a space in which many cultures around the world place great significance. Crossroads can be difficult, mysterious and perhaps even dangerous, he said. The contextualization represents a bold step forward. “Crossroads have come to represent many things to many people, but for today, simply think of crossroads as points of decision,” Neff said. He said the university, as a community, is the sum of its decisions and many more – all the crossroads in its lifespan. Making choices about which path to travel is not always easy, but history records those decisions. The markers contextualize parts of the university’s history and acknowledge its indebtedness to the enslaved laborers who built the campus, he said. The plaques also present narratives of the lives of men who influenced the direction of decisions made throughout history. One provides context for the creation of a century-old tribute to the University Greys. The university’s decisions, actions and errors define it, and the institution meets those with new decisions and actions and corrects its past errors, Neff said. Addressing those past actions defines what the university community is, and who it will be. The chancellor established the CACHC in the summer 2016 to address Recommendation 5 of the university’s 2014 Action Plan, which urged the university to “offer more history, putting the past into context” and to do so “without attempts to erase history, even some difficult history.” The university’s contextualization efforts were an academically- and fact-focused process. The task of the committee was to recommend which additional physical sites on the Oxford campus – beyond those already completed – should be contextualized, so as to explain the environment in which they were created or named. The committee was also charged with designing the content and format to contextualize the recommended sites. The committee’s full recommendations, its final report, and renderings and map locations of the plaques can be found here. Logistics and planning for Friday’s event were led by a committee made up of members of the Oxford campus community. Katrina Caldwell, vice chancellor for diversity and community engagement, and Alice Clark, interim vice chancellor for university relations, served as co-chairs. Student ambassadors read the text on the six new markers during the ceremony. Besides the six sites contextualized Friday, the university will seek to rename Vardaman Hall. The CACHC found that James K. Vardaman was an exceptional case for his time and recommended unanimously to rename the building. The building was approved for a substantial renovation in 2016 and after the work is completed, its renaming will occur through university processes and be subject to IHL approval. Following the ceremony, university shuttles took attendees from the Ford Center to each of the six plaque sites, where student docents and those who served on the CACHC provided information about the plaques.